The FS255B PSTN wireless Alarm Console is with digital and voice auto dialer. 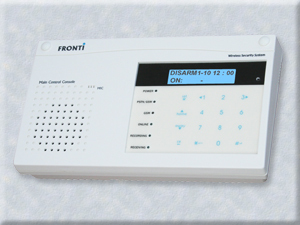 The alarm console can combine with Fronti wireless accessories, like keypad/sensors/siren. The system has completely wireless data communication between wireless sensors and external siren. Two partitions are separated to Arm/Disarm control, for main house and office or garage house, both area are protected. It can option IOT Wi-Fi module that console can working with IOT APP . 10 passwords available on PC and Keypad to set working mode. Set program’s data by keypad and PC. After being connected to emergency call, the called party can listen-in or talk with. Trigger alarm will call-out to contact ID, and then voice dialer will play voice alarm message. It can setting working mode by remote controller or smart phone IOT APP. The smart phone IOT APP can view the all setting program alarm data and all event log of the console.